The city of San Sebastian and the province of Guipuzcoa offer a wide selection of culinary delights in a warm, relaxing setting that is truly a food lover’s paradise. The picturesque European city, located on the coast of the Bay of Biscay in the north of Spain, is home to many dining selections perfect for the discerning pallet – or those just looking for a really good meal. San Sebastian, which will share the title of European Capital of Culture with Wrocław, Poland in 2016, offers visitors a selection of modern and traditional meals. You’ll be hard pressed not to find something appetising. The amazing view of the Cantabrican sea is the first thing you notice here. The second thing you’ll notice is the dazzling array of delicious delights from Spanish chef Pedro Subijana. Despite a reputation as a classic dining spot, everyone is welcome here with award-winning dishes full of rich Spanish flavour. If you like your food fresh, this is definitely the place for you. Most of the ingredients used in the food come from a garden right on the property. Pedro and his team of chefs create elaborate, yet incredibly tasty dishes. Don’t forget to try one of the restaurant’s famed dessert items. Ask for Pedro’s raspberry fritters! Owners EloyLanziego and María del Mar Lanziego are also the chefs here at this delightful classic Basque restaurant. The elegant decor is the perfect backdrop for the traditional cuisine, made with fresh local produce. If you want something a little more daring, there are plenty of innovative and creative dishes on the menu. Top off your visit here with something from the tempting dessert menu. Ask for the avocado and crab salad with your meal. The wine list is considered one of the most diverse you’ll find in San Sebastian. The owner, Martín Berasategui, is one of the best known chefs in Spain. Berasategui combines traditional cooking with special new techniques he pioneered. The result is exciting new dishes that regulars and visitors alike find deliciously appealing. The experimentation doesn’t stop with new dishes. It’s about new combinations and fresh, exciting ways to present tasty favorites in a whole new way. Berasategui serves as an inspiration for many top French chefs including Michel Lorrain and Alain Ducasse. The former mansion adds a touch of class and elegance to the tasty dishes being served up daily. The former farmhouse has been a San Sebastian landmark since 1902. This restaurant serves up traditional cuisine with tasty modern twist. The former farmhouse has been beautifully decorated to highlight the charm of this beautiful city. It is often said the presentation is everything. In keeping with that general concept, all food dishes are beautifully presented and taste just as good as they look. Top off your main course with Matteo’s signature house salad with foie-gras and ham, sardines, tomato and feta cheese topped off with savory aubergine cream. Considered one of the best seafood and Basque restaurants in San Sebastian, Kaia and Asador Kaipe offers a wide selection of fresh seafood daily. The choice of seafood as the specialty of the house is no surprise since the restaurant itself is shaped like a boat, a perfect complement to the fishing port the restaurant overlooks. You can watch the seafood being cooked on the first floor or go up to the second floor to enjoy the view of the port. Local favorites include sole and sea bream. Wrap up your meal with a little ice cream. Named after the farmhouse where head chef Mikel Zuaznabar was born, this restaurant serves up Basque and Guipuzcoan cuisine in a charmed setting with a picturesque view. The prices are reasonable and servings are more than generous. The dishes are somewhat exotic, but absolutely delicious. Customers rave about the attentive service, excellent wine list and delicious desserts. For an extra special after dinner treat, try the chocolate pyramid and raisin ice cream. It won’t take long to realise the appeal of this mesmerising Spanish city. Restaurants in San Sebastian embrace many traditional Spanish dishes while adding unique modern touches for a truly unique dining experience. 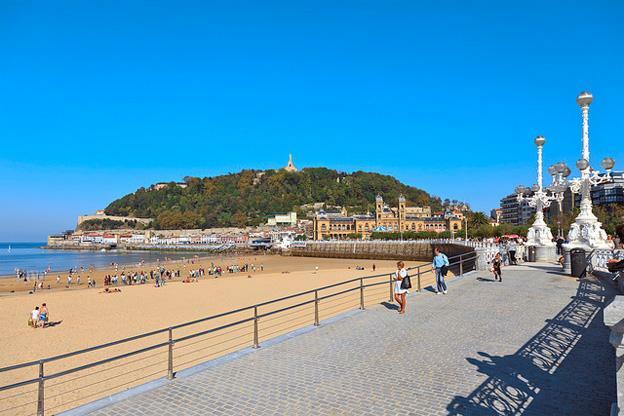 Many local restaurants take advantage of the beautiful view you’ll find in San Sebastian, encompassing the sprawling coastline with the northwest end of the Pyrenees mountain range just off in the distance. If there is such a place as heaven on earth, this just might be it where food is concerned. Sol Hudson the author of the “Foodie heaven in San Sebastian” is an avid blogger who contributes to a number of blogs on a wide range of topics from green living to technology to travel to organic baby products.